I love fall, I love autumn colors, I love Halloween color combos, and mostly I love that purple has become one of the Halloween colors. 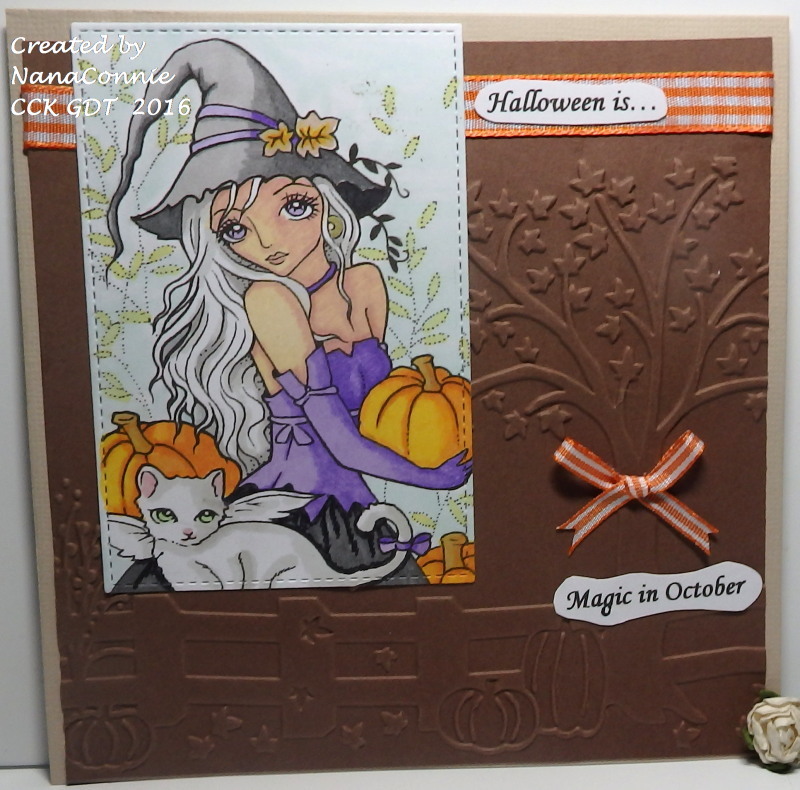 :-D And today, I get to combine all those things into a card which I've done as the Guest Designer for the October challenge on the Ching Chou-Kuik blog. 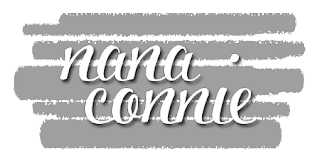 There's also a huge Blog Birthday celebration and you don't want to miss out on the festivities. This image is called "Pick a Pumpkin" and it's one-half of a lovely Halloween set available in the Etsy store here. Since October is underway, we have a theme of "Halloween." The image is colored with ProMarkers, then cut with a Stitched Rectangle die by Die-namics. 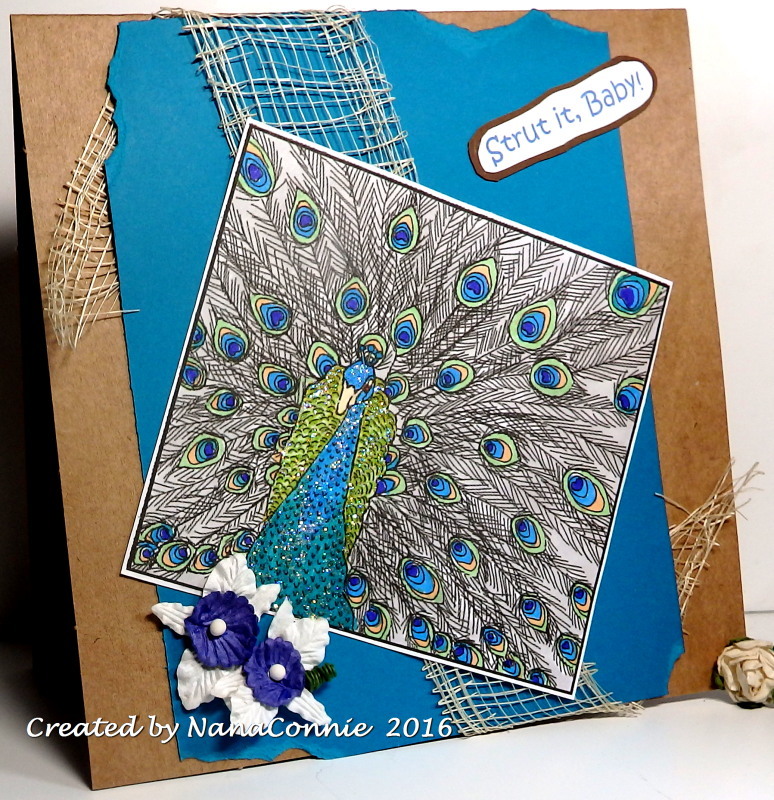 The embossed background was made using a Sizzix folder. Doesn't it look like a slab of chocolate? Mmmm. Both ribbons were remnants in my stash. We have a new challenge starting at QKR Stampede this morning and our theme is "Cut It Up" so do a project with die cuts, or punched pieces, or even something fussy cut, and come enter it. 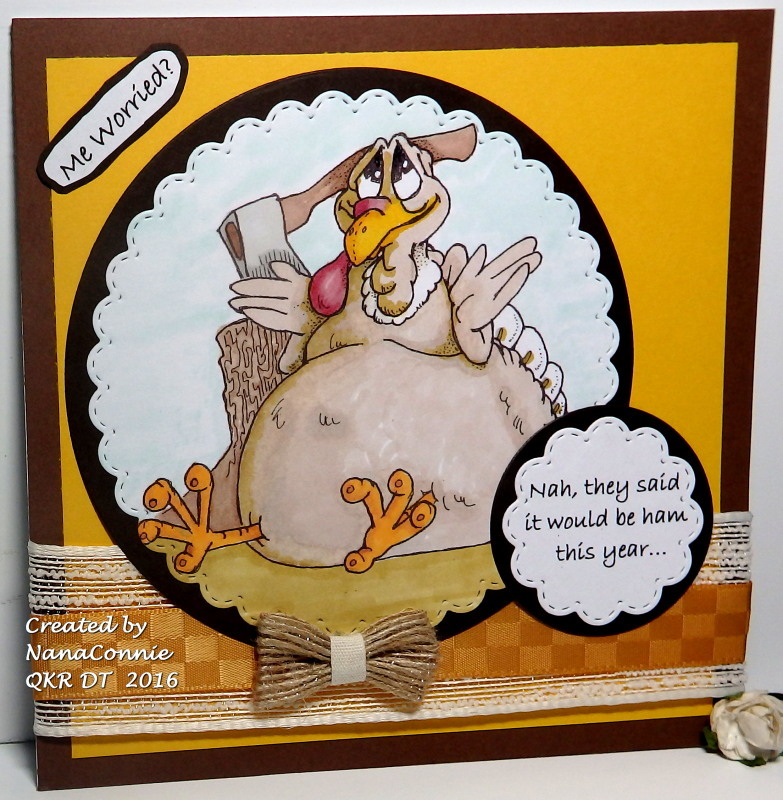 I took the opportunity to do another Thanksgiving card using Digi 16711 "Fat Turkey" for my image. 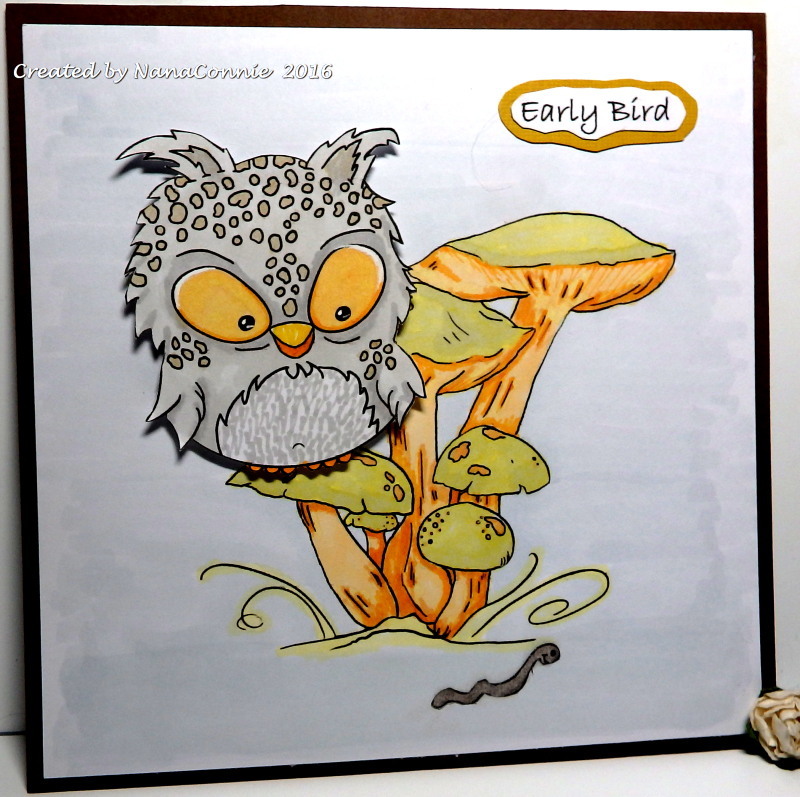 I colored with my ProMarkers, then die cut the image with one of my Scalloped, Stitched Circle dies (Memory Box.) I cut the lower sentiment with a smaller die from that same set. Then I cut the mats with plain circle dies from QuicKutz. The upper sentiment is hand cut and layered onto a dark brown mat. Please continue to leave comments. The "Word Verification" really isn't on. BLOGGER INSISTS ON SHOWING THE "CAPTCHA" BOX BUT IF YOU IGNORE IT AND JUST PUBLISH YOUR COMMENT, IT WILL POST JUST FINE. I WISH I COULD GET RID OF IT BUT THERE'S NO OPTION FOR THAT WHEN THE COMMENTS ARE WRITTEN IN A SEPARATE BOX. SORRY. 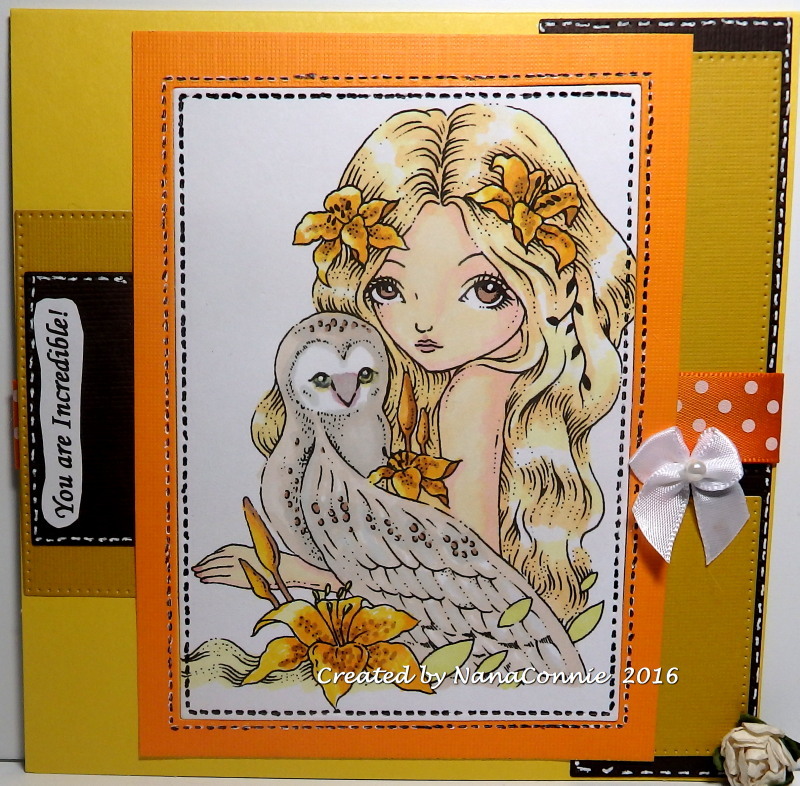 This card uses a sweet image from A Day for Daisies and I'm finally using it to enter their monthly challenge. Nothing like waiting until the end of the month, right? I love those darling little birds flitting around. 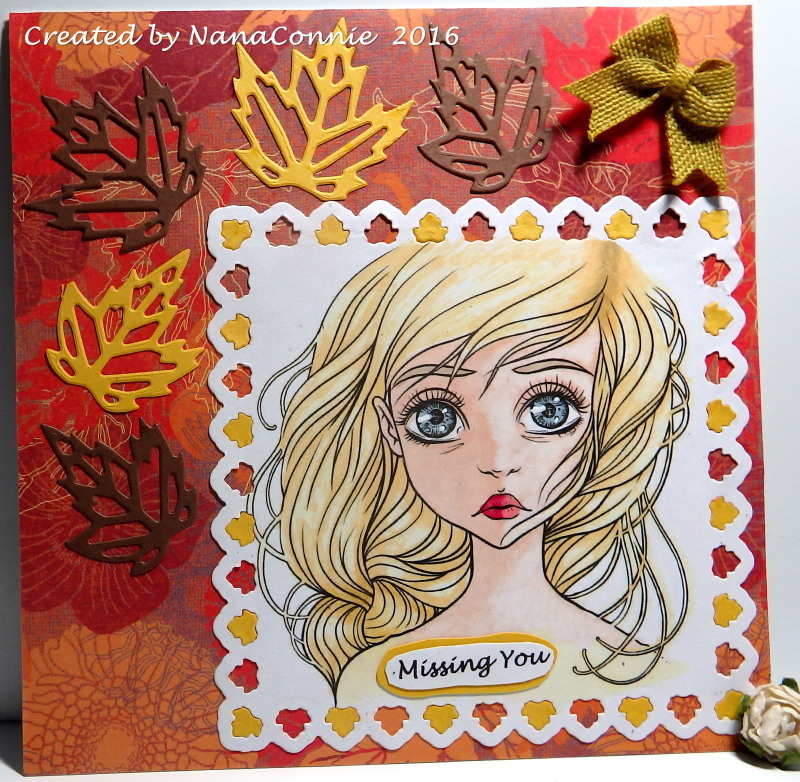 Fall is definitely my favorite season so I colored the image in autumn colors using my ProMarkers, then die cut it. 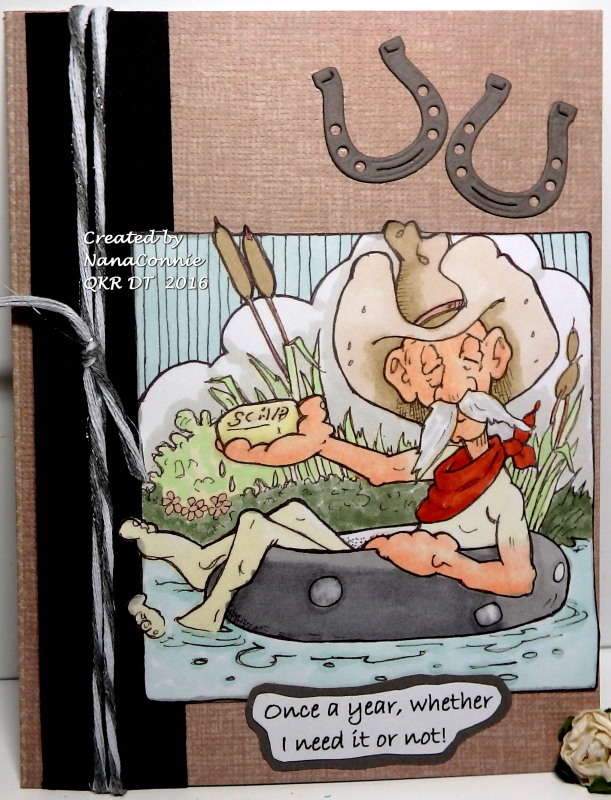 I used one of my Sizzix embossing folders on the water-colored background paper to give it some woodgrain. I actually embossed it while the paper was still a bit damp. It really made the embossing stand out. I used another of the dies from that set to cut that piece after the paper completely dried. I used a Fiskars punch to cut the small leaves from scraps on my desk and layered them so they seem to have a dark shadow around them. The strip of dp was a tiny scrap which I decided to mat and use rather than throw away. The sentiment is hand cut and matted three times, again using up snippits. Finally, I did the satin ribbon bow. At first, I was going to dye it a fall color, but when I dropped it onto the card while reaching for the marker, it seemed to echo the white in the sentiment and in the image so I left it as it was. but I did take a couple of small liberties. 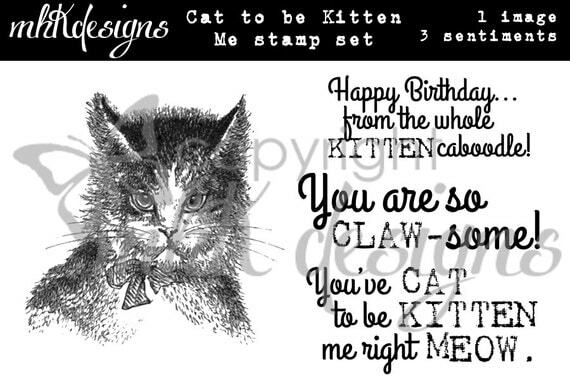 The image came from Sami Stamps but the silly sentiment is my own. I colored that image with my ProMarkers, then die cut it with a Stitched Rectangle die from Die-namics. I cut another, larger piece for the mat. All the polka dot papers were leftovers found in my stash and I tied the striped bow with a snippet of ribbon. I decided to keep it relatively CAS so it could be used for a masculine card. This lovely image is from The East Wind and I just loved coloring her! She was perfect for autumn colors and leaves. 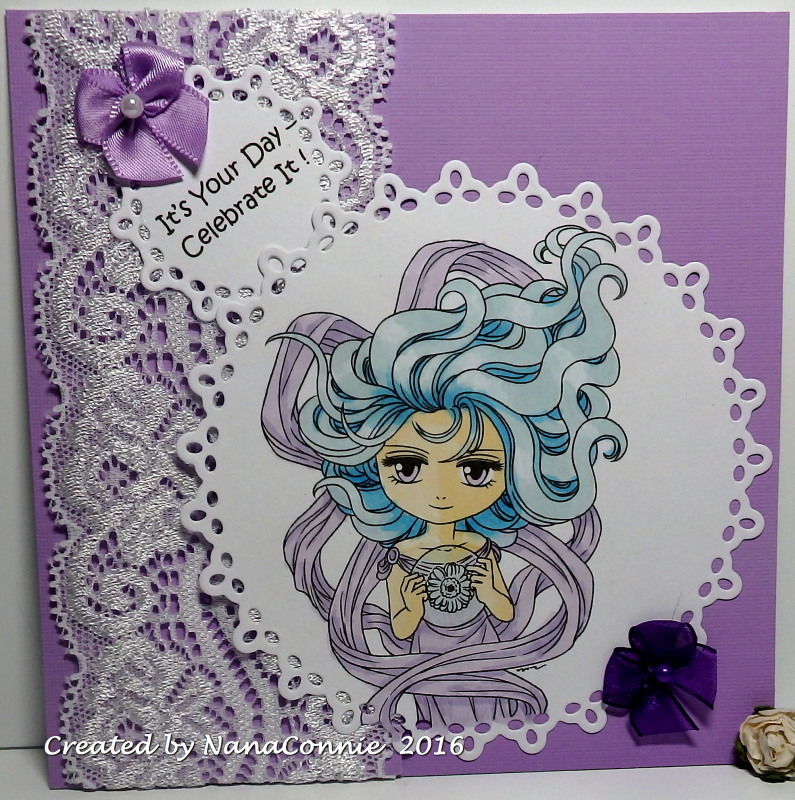 I colored her with my ProMarkers, then used a die from Spellbinders to cut her out. I cut yellow CS with that same die and used the little leaves that fell out of the frame to insert into the white frame of the image piece. 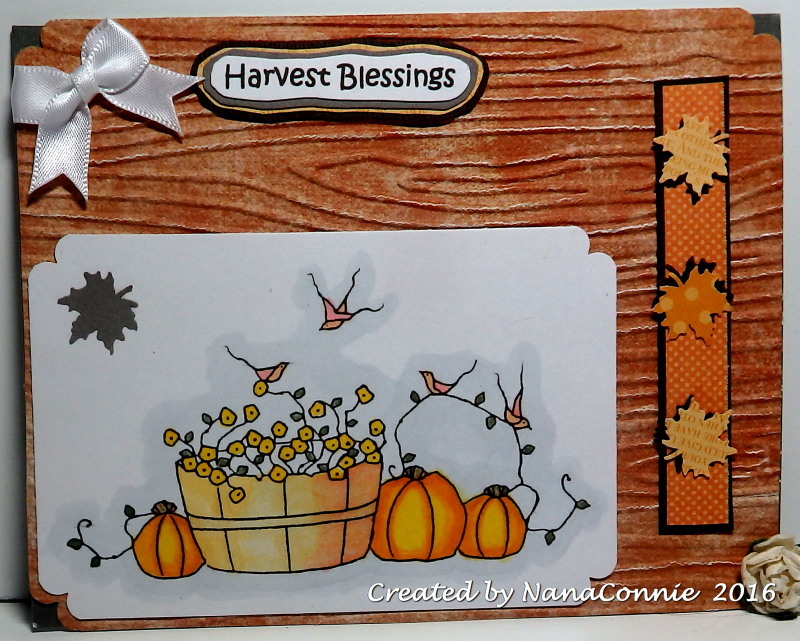 I adhered a scrap of fall leaves dp to the card front, then layered on the image and the yellow leaves. I used a leaf die (Die-namites) to cut both yellow and brown CS, and added those leaves. The die makes a strip of leaves so I had to cut them apart to use them the way I did. Final touch was the burlap bow which has been 'dyed' with a Buttercup Yellow ProMarker. 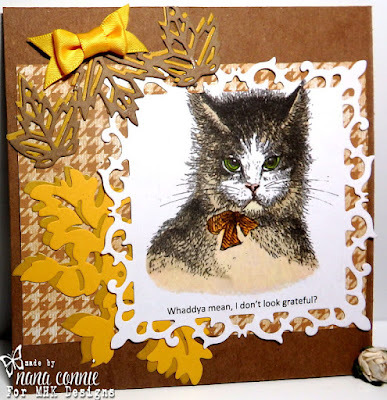 Today I'm sharing a Designer's Inspiration card with you over at MHK Designs and it's a card which pleases me greatly because I managed to use a really cute, non-holiday image (Cat to be Kitten Me) and turned it into a fun Thanksgiving card. I was totally inspired by the autumn feel of the photo at Catch the Bug. Don't forget the September/October challenge is open and we have a wonderful inspiration photo for our theme. However, if you use an image from MHK Designs, then the theme is "Anything Goes" whether or not you take inspiration from the photo. 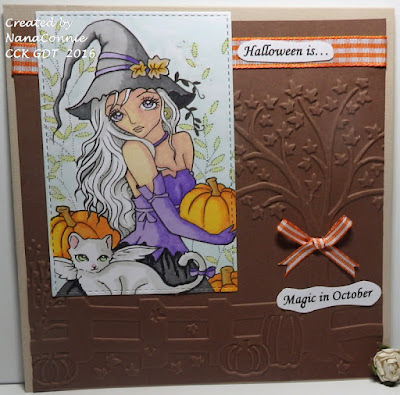 Click on the "Current Challenge" tab at the top of the main MHK Designs page to go to the challenge and to see the inspiration photo. I was so struck by this image from Aurora Wings, I could hardly wait to color it. But I debated for quite a while as to which medium and finally decided on my watercolor pencils. I do love the way they blend out the pencil marks with just a bit of Gamsol. But now I want to enlarge the image to coloring book size and color it with my ProMarkers. That one I'll probably frame and hang in my craft room. Instead of a circle for my image shape, I chose to do a rounded rectangle by die cutting a rectangle and rounding the corners with a Fiskar punch. I did the same thing with the mat made from sparkle CS. After placing that piece onto turquoise CS, I added brads and sparkle twine, then layered it onto a navy blue background which I used for the card front. The final touch was one of my bowtie bows, appropriate for a masculine card. I was browsing around some of my favorite challenges and found the one at Double D with a theme of "Trees." Most, maybe all, of the DT ladies had used die cuts on their cards, including die cut trees. That inspired me to grab two of my own dies (Die-versions) and make this card. It may be a bit hard to see but the tree and fence are die cut from black CS and the owls on their tree branch are cut from dark brown CS. 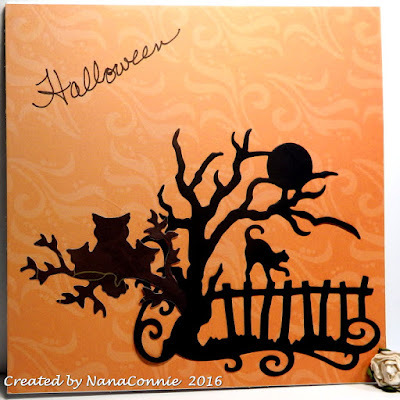 Those are two different dies and I just layered them together to make the Halloween silhouette for the card. 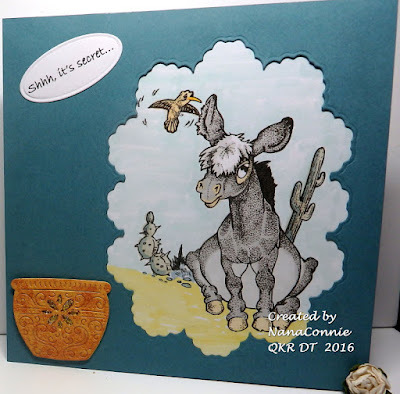 Our newest challenge has started at QKR Stampede and our theme is "Embossing - Wet or Dry." I got a little carried away when I saw this darling Donkey (Digi 1005 - "Donkey") but my card needed to be a celebration of the American Southwest. Of course, the cactus in the image helped with that look but I've made a whole set of these to use as invitations to a surprise birthday party where the theme is the Southwest, including all the decorations and even the menu. In order to accentuate the Southwest mood, I dug out one of my Cheery Lynn dies, cutting and embossing the ceramic pot three times, then layered them together and embossed the layered stack once more so that theembossing would really show up. Finally, I added a bit of sparkle to the flowery cutout on the pot. I went with fall colors and lots of layers and I used my ProMarkers to color these sweet little guys. Don't they just look soft enough to touch? 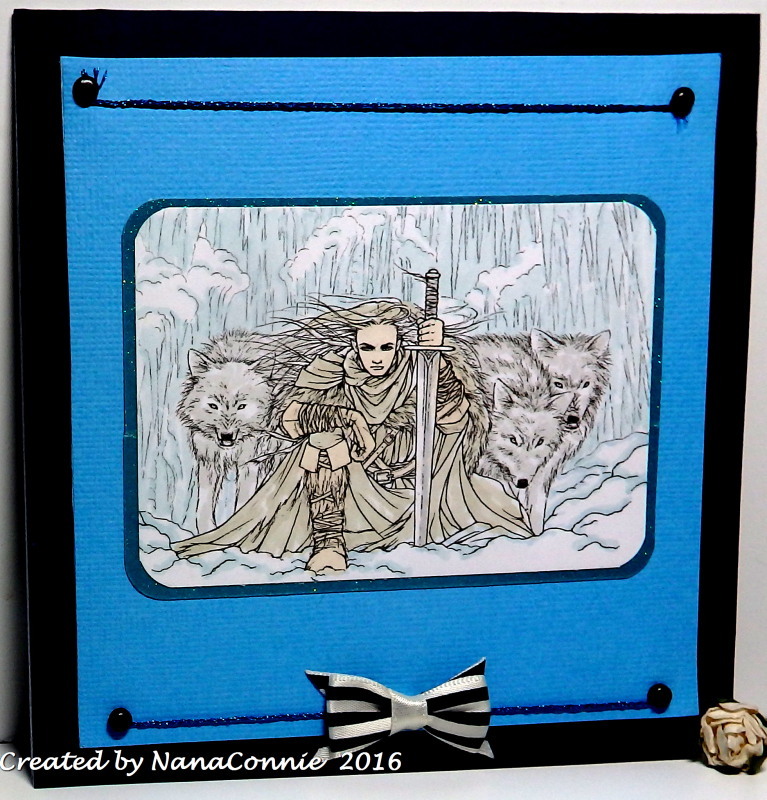 I die cut the image with one of my older dies from Spellbinders, then matted it with another die cut one size larger. 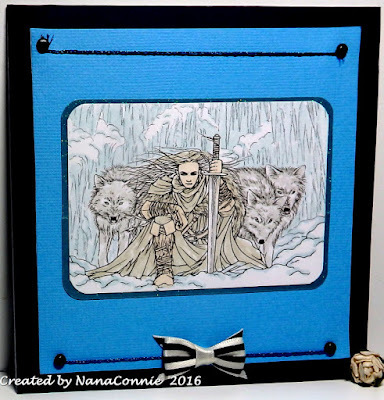 The sentiment is matted and that's was the smallest die from that same set. All the papers are scraps and I believe each one is from Stampin' Up. I punched the butterflies from the same dp as the sentiment mat and added them to the opposite corner. My second card has Ike's magnificent Peacock and I colored it with my Lyra polychromos pencils. After coloring the peacock, I added glitter to the body and green part of his tail. The image is die cut with a simple square die (QuicKutz.) I found a scrap of peacock blue CS, tore part of each edge, and wrapped the fibers around it before mounting the image to it. 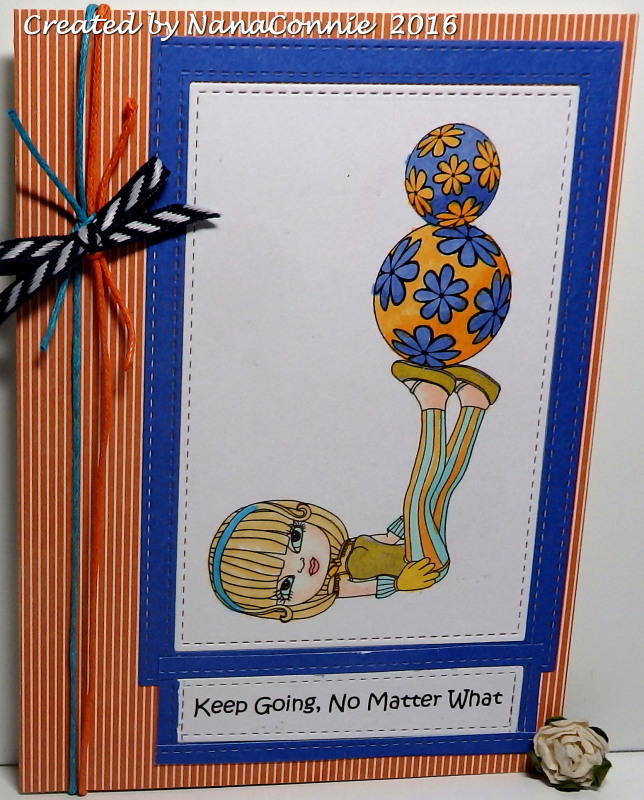 After that, I layered everything onto a kraft card base and added the sentiment and the flower embellies. The final card uses one of Ike's beautiful birds. To color this one, I used watercolors and a brush. That was no easy task because I decided I wanted to do a black and white card with only a splash of one color and watercolor sets rarely have black in them. I mixed several of the browns and dark grays together to get the shades used and I think it came out pretty well. I cut the image plus the two yellow circles with a Stitched Scalloped Circle die from Die-namics. 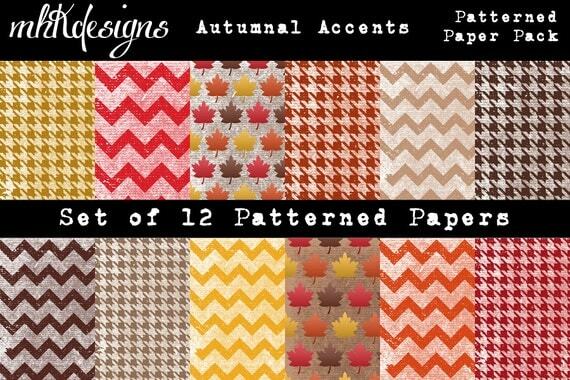 The papers are all from the DCWV "Midnight Chic" stack. I found that lace in my stash and decided it was perfect for this rather vintage card. The final touch was the large, white bow. 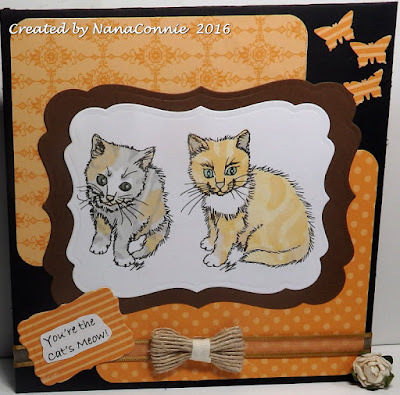 Our new challenge starts this morning at MHK Designs and we have another wonderful inspiration photo with lovely colors as well. You can use either the photo or the colors as your inspiration. 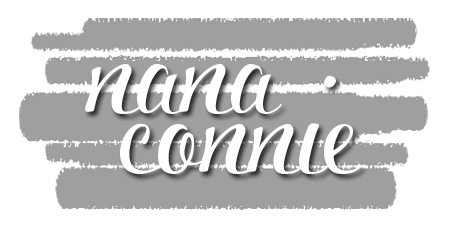 As another option, you can use an image from MHK Designs and the theme is then "Anything Goes," even without the inspiration photo. 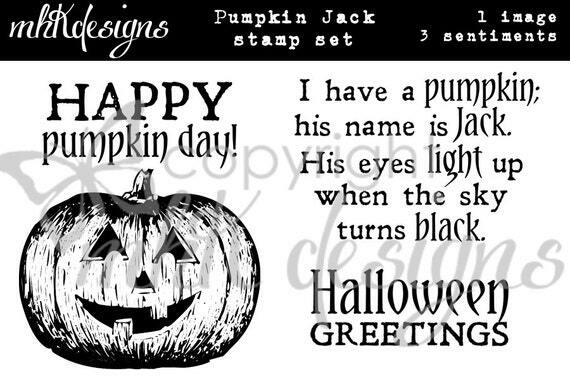 I used MHK Designs "Pumpkin Jack" set for (both image and sentiment), and then used as many of the colors as possible. The image is colored with my Lyra pencils, then fussy cut. 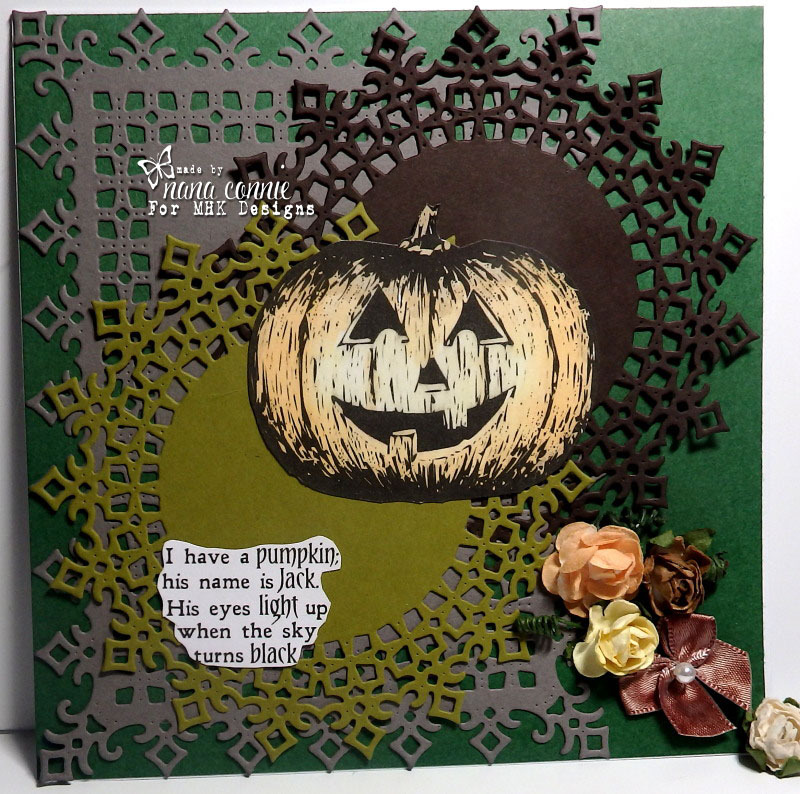 The rectangle and both doilies are cut with Cheery Lynn dies. Everything is layered onto deep forest CS, and the sentiment is hand cut. I used my ProMarkers to dye the roses the exact colors I wanted. Originally, they were all white. This is my last card as a Guest Designer at Scrapy Land and I'll be so sad to leave them. 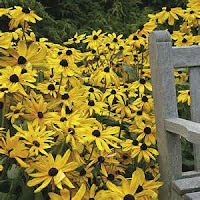 But I get to hang out for another couple of weeks, commenting on your wonderful entries and being so inspired by them. I decided on a very CAS design, all done from scraps and snippets and using all die cuts except for the burlap bow. The sentiment is cut with a die from Sizzix (Tim Holtz - Celebrations) and the rose die is from Die-Namites. I cut the rose three times, once in green and twice in two different shades of pink. The darker pink is CS and the lighter one is paper. I cut the rose off the green stem to use the stem and leaves alone. The two pink roses I layered together, slightly offset for a shadowed effect. I hope you like this CAS creation. I'm rather thrilled with it myself since it actually turned out even better than the way I had visualized it in my head. :-D Come play along, won't you? 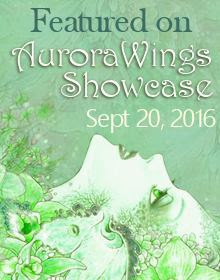 Card Featured at AuroraWings Showcase ! 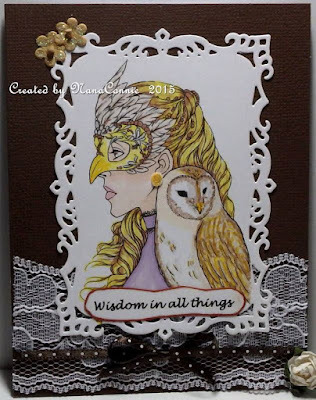 I was so honored when Mitzi, the artist at AuroraWings, told me she'd be featuring a card I made on her AuroraWings Showcase today. Is this the cutest baby owl you've ever seen or not? I fell in love the instant I saw it and, since it's from Limited Runs, it was perfect for an entry into their 3rd Facebook challenge. I combined two different images from Limited Runs, the mushrooms and the owl. The little worm happens to be part of the image with the owl. I printed the mushrooms, then colored them with my ProMarkers. I hand cut that piece so that it was just slightly smaller than the card front and put brown CS behind it. Finally, I printed, hand cut and matted the sentiment, adding it to the upper corner of the card. 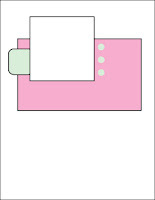 No ribbon, no bows, no flowers, no gems -- just a flat, simple card, easy to mail. I thought this cute circus performer (Scrapper's Delights Progressive Freebie) would make a great encouragement card for a gal trying to decide if continuing with college is something she can do in the face of also raising twin 6 year-olds. It does seem to be a juggling act, and nobody knows that better than I since I did that whole parent vs college student decision many years ago. In the long run, it was worth everything it took, including a lot of nights with little or no sleep. Some people said I was lucky to graduate but was it luck or making one's own luck through perseverance? 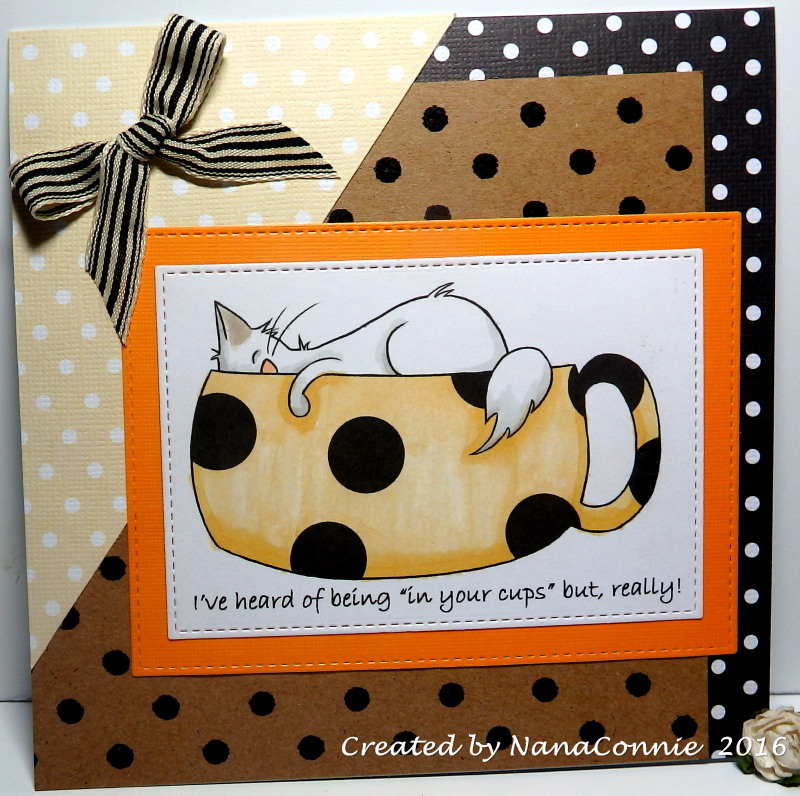 The image is colored with my ProMarkers, then die cut with stitched rectangle dies from Die-namics, as is the sentiment. I layered that onto striped dp from the DCWV "Basics" stack. That became the card front and I added the twine for a bit of embellishment but still kept it a very CAS card design. 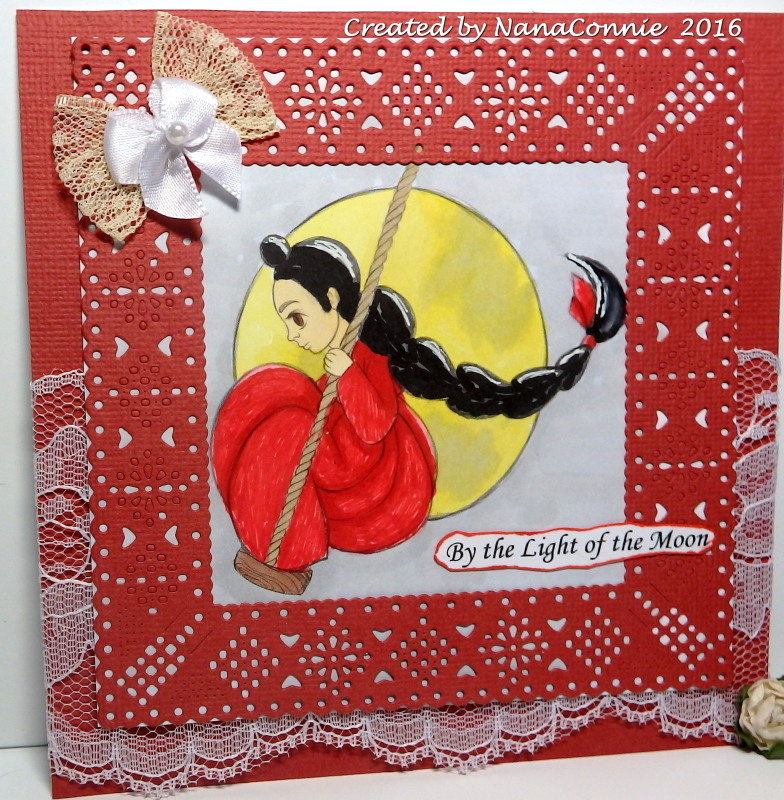 I finally got my card done for the September Progressive Challenge at ArtbyMiRan. I had lots of fun coloring this one and it didn't take me long to settle on my favorite color combo, lavender and aqua. I colored with my ProMarkers, die cut with a set from QuicKutz, and began thinking of design ideas for the card. I was digging through the boxes of ribbon and lace when I discovered that I still have about 18 inches of that particular lace. I thought I had used it all but there it was, a perfect complement for that image! I knew the lace wasn't going to look as dramatic if I laid it across a white card front, so then I went digging for exactly the right shade of lavender CS. Once that was found and adhered, the lace went on, then the sentiment and image. I debated between flowers or bows but decided the bows worked best, one in pale lavender, the other in rich purple. I pulled my colors from the inspiration photo at Time Out. I colored the image with my ProMarkers, making sure I included the "Cowboy Tan." I admit I had to work a bit to figure out exactly how to do it but I laid colors onto a scrap piece of paper to see what would work. I didn't leave his untanned skin uncolored; I used a "Satin" ProMarker which gave it a rather pasty-white look. After it was completely colored, I used a rectangle die and did an out-of-the-box technique on his feet, on the cattails, and his hat. 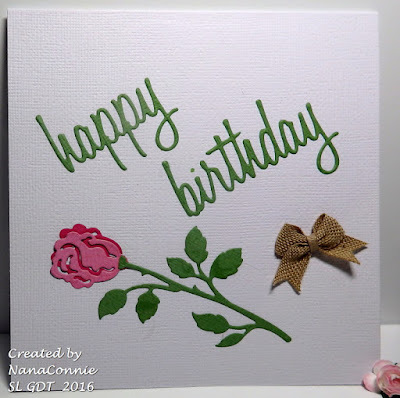 I ran the front of my card base through my "Linen" embossing folder for a tiny bit of texture, added the strip of wide black ribbon, the image, and the sentiment, then wrapped the twine around it on top of the ribbon. 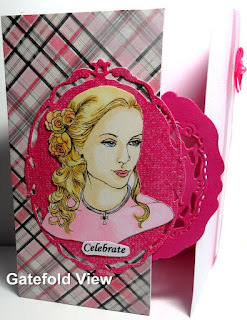 The horseshoes are cut with a Cheery Lynn die. The sentiment is a play on meaning since I plan to use this as a birthday card for a friend who thinks of himself as a cowboy but hates celebrating each year. He thinks once you reach 50, birthdays should only come around once every five years or so. :-D Like I said, a fun masculine card. 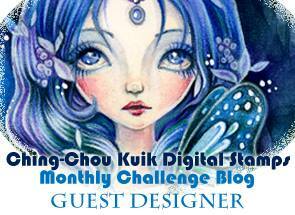 New challenge today over at Morgan's Artworld and our theme is "More Than One Fold." I've done an overlapping, gatefold card using one of Morgan's gorgeous Cameo images. 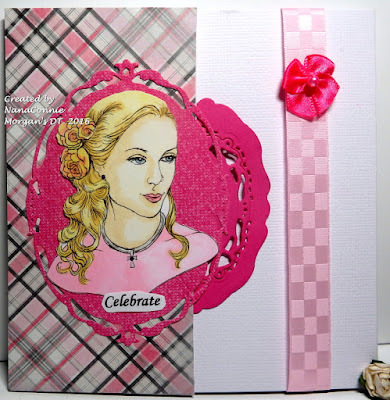 This one is "Cameo 17" which just happens to be our Monthly Stamp so it's at half price. Of all the Cameo images at Morgan's, this one is my absolute favorite! Here's another snap with a better view of the gatefold. I colored her with my ProMarkers, then fussy cut and layered that onto a die cut, vintage frame (Spellbinders.) I used a snippet of plaid dp for the background on the left side of the card front. I also found a scrap piece of pink CS on my desk and cut another frame piece from it which I adhered to the back of the left flap. The ribbon I chose came from Really Reasonable Ribbon and the bow is one of those I make by the dozens and toss in my stash for later use. This one was originally white but I 'dyed' it with one of my ProMarkers. The pearl was also white but I colored it with the same ProMarker. Here I am back with the Twisted Thursday Challenge at the Outlawz but this time as a GDT, not a DT. Either way, it's fun to be back even if it's just for one week. :-D The sponsor for the TT challenge this whole month is Digistamps 4 Joy and they supplied a few digis for the DT ladies to use. I chose this wonderful Cameo image. The theme at TT is always "Anything Goes" but they usually have an optional twist to go with it and this week the twist is to "Use Punches or Dies." That's right up my alley -- I love using dies! 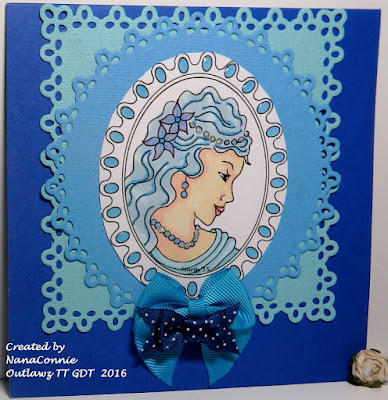 I decided that a monochromatic card would be fun so I used various shades of blue ProMarkers to color most of the image, then dug out two sets of QuicKutz dies and one plain oval die from Spellbinders. The image itself was cut with the oval Spellbinders' die and the two mats were cut with the Round and Square dies from QuicKutz. I added Glossy Accents to each of the "gems" circling the cameo and added glitter to her necklace, hair gems, and earrings. 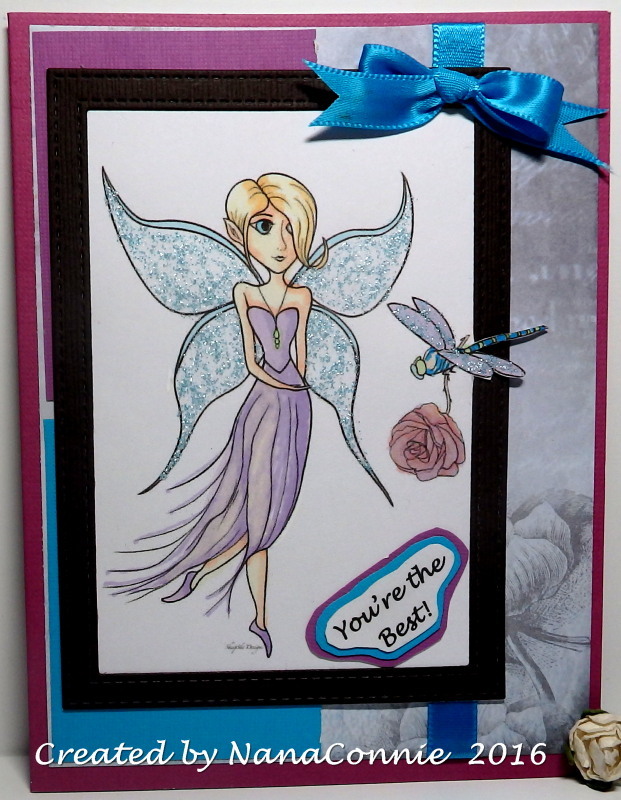 I layered everything together on a blue card base, and added two bows as the only embellishments. I really wanted the decorative dies to be showcased instead of buried under tons of embellishments. 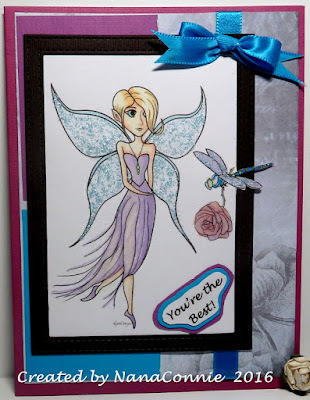 Wouldn't it be great to be a fairy with your own personal dragonfly to bring you a rose and say something warm and encouraging that you could carry in your heart all day? I did this card for a friend of mine who's having some rough moments - just so they'll know I'm thinking of them. This darling image is from Sheepski Designs and I colored it with my polychromos pencils. I added glitter to the wings of both the fairy and the dragonfly. It's a bit hard to see but the black frame is cut with an Inside/Outside Stitched Rectangle die from Die-namics. The satin ribbon is from my stash, as are the purple and the turquoise CS scraps. I found that bit of dp in one of my stacks of 'cut-once-leftovers' but it was large enough to use as background here. 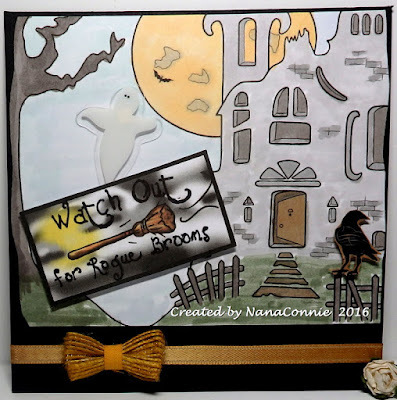 There's nothing worse on Halloween night than having to duck and dodge all those rogue brooms flying around, creating chaos. :-D My card this morning combines a fun background stamp (a freebie from the Sheepski Facebook page) with a sentiment from Limited Runs. 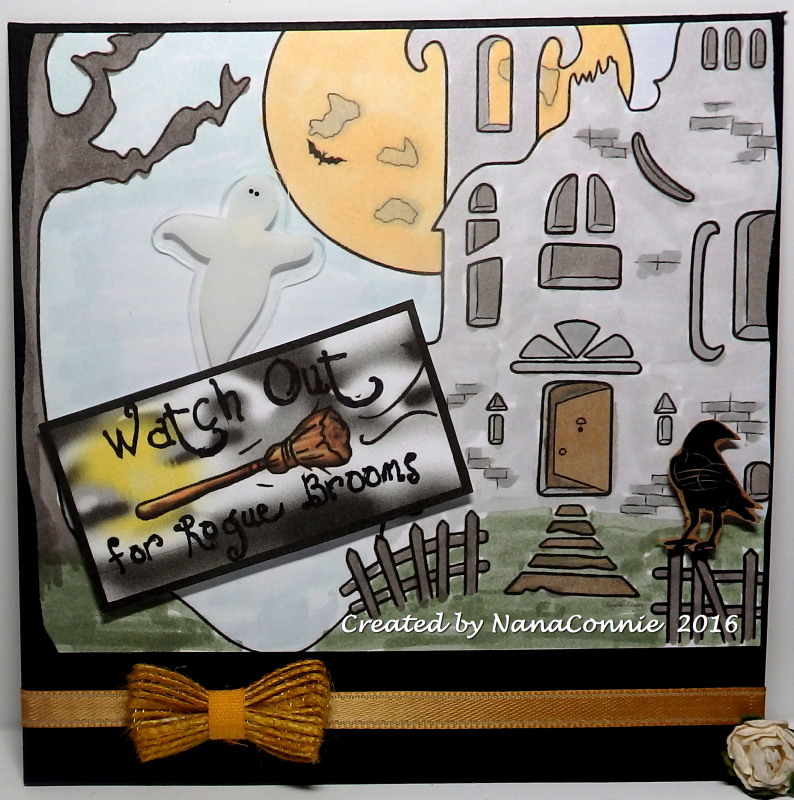 I used watercolors for the background, added the ghost and the die cut crow (bits left in my stash from last year), and adjusted the size of sentiment rectangle so that it became the focus popped up from the background (and so that it fit my rectangle die exactly. :-D) I used a black card base and wrapped the gold ribbon around the card front, then adhered the burlap twine bow. 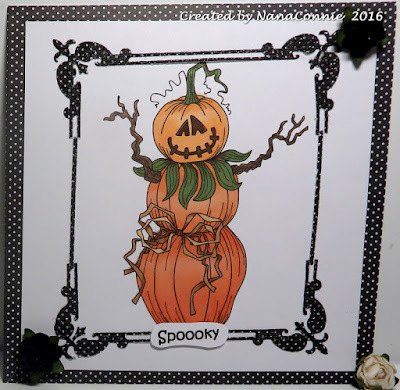 I love this fun and funny scarecrow stamp from Beccy's Place! I've seen lots of fall scarecrows but this is the first one I've seen made from pumpkins. I used the sketch from The Outlawz, reversed. The scarecrow is colored with ProMarkers and cut to size. 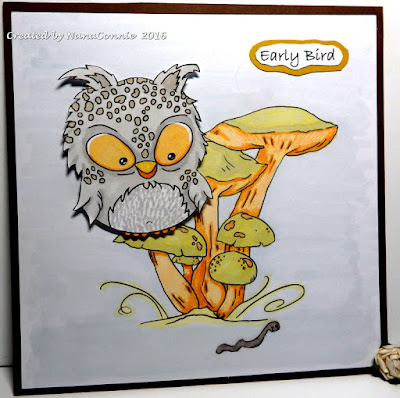 The frame is a die cut (Bo Bunny) which I had to cut and enlarge to fit the stamp size. Everything is mounted onto polka dot dp (DCWV - Midnight Chic) and I added two black roses for embellishments. The sentiment is computer printed and hand cut. Owls are supposed to be such wise birds, how do you suppose a conversation with one would go? Would you be any wiser when you walked away? My daughter loves owls and I love finding stamps with owls that I can use on cards for her. This one, by Ching-Chou Kuik and called "A Little Talk," captured my heart and I'm sure it will capture hers, too. I colored this lovely image with my Copics and ProMarkers and then die cut it using Stitched Rectangle dies (Die-namics.) I also cut all the other rectangles with either stitched dies or pinpoint dies (Memory Box.) On some of them, I used ink to emphasize the stitching. I used a scrap of ribbon from my stash and one of the bows I make by the dozens, also from my stash. The sentiment is something I say to my daughter all the time. :-D Her birthday in in October so this may very well become her birthday card. But I could end up giving it to her just so she knows I'm thinking of her. I colored the image with a combination of ProMarkers and polychromos pencils plus a dash of gel pen. I framed her with a die cut frame (Cheery Lynn - Dainty Dutch Deco) which I used today for the first time. Oh, that die set is going to get lots of use -- I love it ! It gives such a pretty vintage touch to everything. I worked on a red CS base which I ran through my "Linen" embossing folder, then added the wide lace and the image on top of that. I made a double bow with lace for one layer and satin for the other. 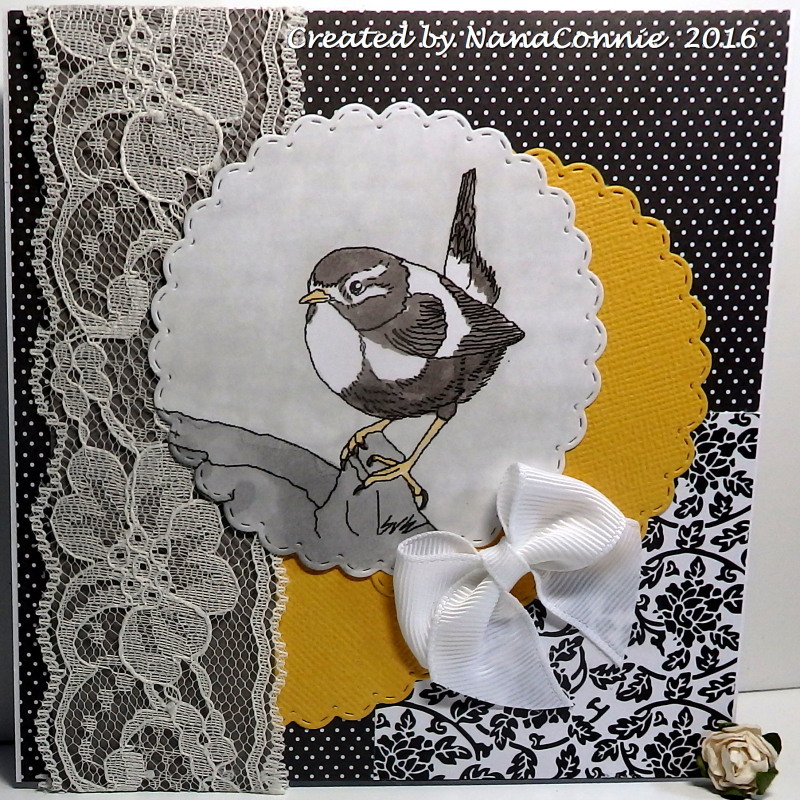 This is another of those cards which looks very complex because of the vintage framing and the lace but which was relatively simple to put together.